A hugely popular exhaust for the E30 M3 around the world, the SS race is available with straight tips or DTM tips. Race car style and sound for your street or track car. 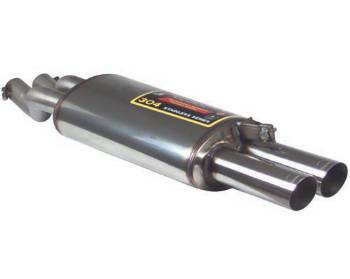 All Supersprint mufflers are of the flow through resonated design. This means each unit has no chambers or baffles to reduce velocity. Simply, a straight through in & out design. The internal components are 100% stainless steel with a high heat resistant rock wool sound suppressing material. Tubing is always mandrel bent for maximum flow. Flanges and hangers are O.E. or better quality for a perfect fit every time. Housings are all manufactured from 1.5mm material that is M.I.G. welded at all seams. The stainless systems are 100% 304 stainless, the mild steel systems are aluminized on the inside and out, then black heat coated for corrosion prevention.